Easter is lovely and true opportunity for families to reunite around a gorgeous and rich table, and enjoy food and ancient tradition connected to rebirth and religious rituals. Rome is “the” Italian destination for Easter week, called in Italian “Settimana Santa”, with the manifold events linked to the Pope in Vatican City and around Rome. Easter Week starts always on Palm Sunday (Domenica delle Palme): a special mass is led by the Pope in Saint Peter’s Square. This event is free,but the square will be very crowded and it is hard to get in. If you want to see the Vatican Palm Sunday mass, you should be there very, very early. Also you have to know that it is not unusual just to stand up for hours so bring a little chair with you and water. The Blessing of the Palms, the Procession, and the Holy Mass for Palm Sunday are all in the morning starting at 9:30 am, and they will be held in Saint Peter’s Square. The Holy Thursday Mass will take place in the Saint Peter’s Basilica at 9:30 am. A Papal Mass is also led in the Basilica of Saint John Lateran usually at 5:30 pm. 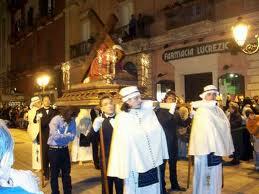 On Easter Monday (in Italian “La Pasquetta”) is a free time for everybody. Nor schools neither work, and it is time to go around and visit somebody or going out with some friends to have a picnic or a nice gathering for a chit-chat. So a lot of Italian cities displays dances, free concerts, or games involving the use and the abuse of… eggs! In the Umbrian medieval town of Panicale, cheese is istead one of the main tools of gaming. “Ruzzolone” is in fact a funny and strange game. You will play by rolling huge wheels of cheese (about 4 kilos) around the village walls. But why such an effort? The main goal is to get your cheese around using the fewest number of strokes. The cheese contest is folowed by a band in the piazza. Rivers of wine make the effort even more difficult and funnier! This entry was posted on Thursday, March 15th, 2012 at 12:34 pm	and is filed under Events in Italy. You can follow any responses to this entry through the RSS 2.0 feed. You can leave a response, or trackback from your own site. It helps to share your views with all the interesting people, also help to connect with the others people with branding, social networking, site url linking and many more..
Hello, Does anyone know what time the ruzzolone festival starts in panicale? I have been searching on the Internet but I can’t seem to find any information. Please help!